Much of the documentation work in law practice needs to be often done out of office: while traveling from one place to another, while at home after office hours, or in the courtroom between different proceedings. Besides, there are the associated elements like the case database, time-tracking, document assembly, contact management, calendaring, docketing, as well as time and billing, which tie you down to your desktop or laptop. The traditional remote working options and their limitations in terms of access and full functionality have always made remote working a tedious task for the lawyers and their staff. Most of the in-house options for delivering remote access with mobility and consistency entails a full-fledged IT team to setup, maintain, and manage the infrastructure. And as your in-house environment for remote access grows bigger, you would need to invest in capital expenditure, upgrading the systems. Apps4Rent brings down the gavel when it comes to deciding the choice of Virtual Desktops for legal practice. As fully managed Virtual Desktops, from operating system updates to hardware upgrades to patch maintenance to system resource monitoring, everything is handled by us. We also take care of the data backups, disaster recovery, and give assurance of 99.9% guaranteed uptime. With our Virtual Desktops, you can take online all your favorite legal applications like Rocket Matter, LexisNexis, ProLaw, Logikcull, Clio, MyCase, Prevail Case Management, HoudiniESQ, and many more. Since more than a decade, Apps4Rent has been trusted by more than 10,000 clients from across 50+ countries for cloud hosted technologies – you too can count on our knowledgeable, 24 x 7 support to help you smoothly take your desktops and all its legal applications online. Our Virtual Desktops for legal practice are completely secure and confidential. These are provisioned from SSAE16 Type II certified datacenters in US that are compliant with stringent standards like HIPAA, HITECH, GLBA, FCRA, FACTA, Red Flags Rules and others; our entire infrastructure is further secured by CISCO ASAs with IPS enablement. All data on the Virtual Desktops stay centralized, secure, automatically backed up, and is available to you on demand. Virtual Desktops save money on licensing costs, as you will not need multiple licenses for multiple computers or devices. You pay per user and not per machine; you can easily add and delete users incrementally as per your need. You also save on time as there is no need to install the application for every new user as in the case of regular desktops. Our expert team of Microsoft-certified senior professionals is available 24 x 7 to you on phone, live chat, and email to solve any issues you might have with the Virtual Desktops. They understand how legal practice management software work and appreciate the workflow as well as the law firms’ culture. 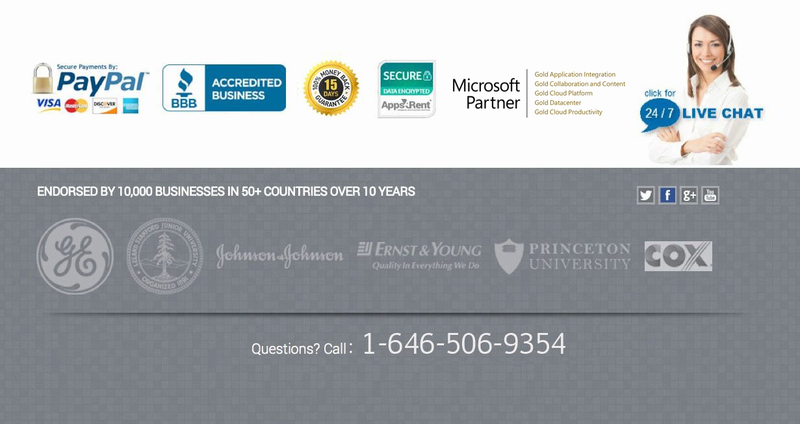 Apps4Rent is thus renowned for its end-user support and is a Tier-1 Microsoft Cloud Solution Provider as well as a Microsoft Partner with Gold certification.